Irises are one of the most elegant of flowers, don't you think? Regardless of the color, they add a beautiful statement to the flower garden. I used the bearded iris at left for a reference for this painting. I like them for their two tone purple color with dark velvet falls. Their buds are lovely too - almost like satin. This colorful oil painting uses thick brush strokes to define the lovely curve of the petals and buds. 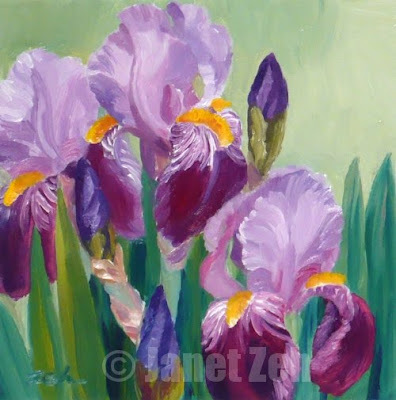 You can find more of my floral paintings and prints for sale at JanetZeh.Etsy.com. Thanks for stopping by to see the irises. Have a lovely day!